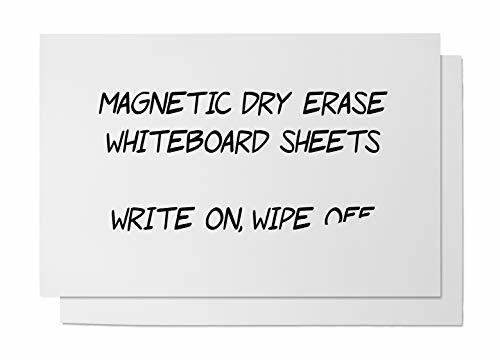 The Write-On/Wipe-Off magnetic sheeting is strong flexible magnet that allows you to use dry erase markers on the front side. The magnetized sheeting has a dry erase front and black magnet on the back. Easy to use and cut using scissors or a utility knife. 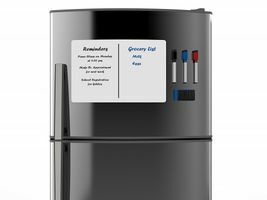 The Dry Erase Magnet is great for restaurant menu boards that are changed daily, in offices, classrooms, in factories to track production schedules, and more. This magnet is not printable, does not have adhesive, and only use dry erase markers on the magnet. BLANK DRY-ERASE SHEETS: flexible magnetic dry erase sheets with a glossy vinyl surface that is easy to write on and wipe off with dry erase markers. REUSABLE: Write on them with a dry erase marker, wipe them off and use them over and over again! These dry erase sheets are an excellent environmentally-friendly alternative to sticky notes. It's strong magnetized backing fixes securely to most magnetic receptive surfaces. PORTABLE WRITING SURFACE: Ideal for use in school, at the office, or at home. Conveniently create a whiteboard surface to write down your chores and to-do lists. Make your own erasable calendar planners, message boards, grocery shopping list, and more. MULTIPURPOSE VERSATILITY: These flexible magnet sheets are suitable for a multitude of uses. Each sheet is easy to cut and fashion into decorative magnets, magnetic signs for cars, teaching aids, and other craft projects. Transform Any Surface Into a Dry Erase Whiteboard! Easy Application -- With this magnetic whiteboard sheet you can turn an iron surface into a whiteboard in no time. Just cut the sheet to the desired size and attach it to an iron surface. Now you can write on it with dry erase markers. When you are done using it, you can just remove the sheet, roll it up or put it up somewhere else. Ideal for use in the office or classroom, booth or store construction. Plain Magnetic Sheets: These magnets are without any laminations.